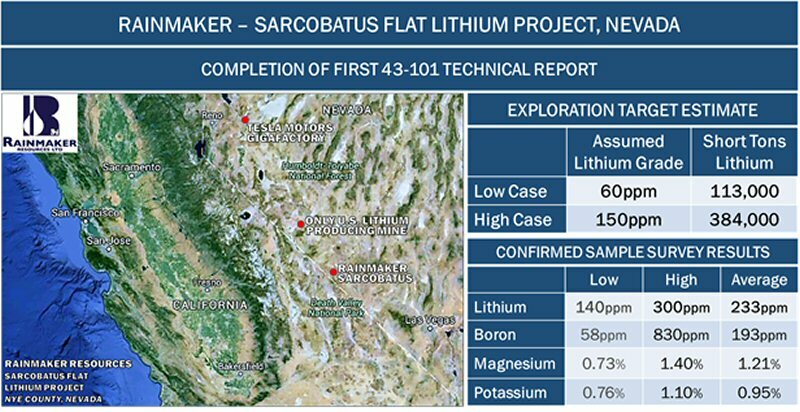 VANCOUVER, BRITISH COLUMBIA--(Marketwired - Nov. 3, 2016) - Rainmaker Resources Ltd. (TSX VENTURE:RIR) ("Rainmaker") is pleased to announce successful completion of its first NI 43-101 Exploration Target Technical Report for the Sarcobatus Flat Lithium project in Nevada. The report indicates very positive exploration potential exists on the property, with high lithium content and a geologic setting similar to that of nearby producing Lithium brine deposits. "This milestone marks Rainmaker's first technical report, and we are very excited by the results of this study, which clearly indicates both the quality of the asset and the potential for significant lithium brine," Chris M. Healey, P. Geo, President and CEO of Rainmaker reported. "The next steps in the development of the asset would include completion of the recommended geophysical surveys, which will enable us to subsequently launch an optimized drill program, culminating with a PEA." The report was completed by Doug Beahm, P.E., P.G., Principal of BRS Inc, located in Riverton, WY. Mr. Beahm concludes that the property has the exploration potential to host lithium brine resources in the range of 113,500 to 384,000 short tons* of lithium carbonate. 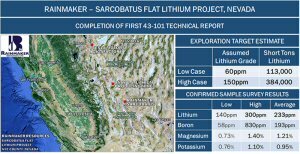 Mr Beahm states in the report that, "Sarcobatus Flat is an early stage exploration project seeking Lithium brine deposits within a closed playa basin in the Basin and Range Geologic Province of Nevada. The geologic model for the Project follows the US Geological Survey Preliminary Deposit Model for Lithium Brines (Bradley, D, et al 2013). The geologic setting of the Project is similar to that of producing Lithium brine deposits in the Clayton Valley approximately 45 air miles north of the Project." Additional consideration was given to published results on a property immediately to the east of the Rainmaker property. *Numbers rounded. The foregoing estimate of an Exploration Target for the Project is allowed as a restricted disclosure under NI 43-101 Part 2.3.2, which defines the disclosure of the potential quantity and grade of mineralization, expressed as ranges, for further exploration. All tonnages, grade and contained lithium as stated in this release should not be construed to reflect a calculated mineral resource (inferred, indicated, or measured). The potential quantities and grades for exploration targets are conceptual in nature and there has been insufficient work to date to define a NI 43-101 compliant resource. Furthermore, it is uncertain if additional exploration will result in discovery of an economic mineral resource within these areas. The full recommendation for exploration and development of Sarcobatus Flat includes 6 phases, culminating in a Preliminary Economic Assessment (PEA). The report recommends that the Company initially carry out two geophysical surveys, gravity followed by CSAMT (controlled source audio-frequency magnetotellurics). The expected cost for these 2 phases is estimated at US$125,000. This would be followed by phase 3, an initial drilling program in order to determine the presence or absence of lithium-rich brines, expected to cost approximately US$600,000. Subsequently, phases 4 and 5 would include conceptual engineering, reservoir analysis, and a follow-on drill program. The estimated cost for all of the above recommendations, inclusive of a Mineral Resource Estimation and PEA, is noted at US$2,375,000. To view the map associated with this press release, please visit the following link: http://www.marketwire.com/library/20161103-rainmaker-map.jpg. Sarcobatus Flat is located approximately 70 km southeast of Clayton Valley - home to the only producing lithium mine in the United States. According to a recent U.S. Geological Survey, "Lithium supply security has become a top priority for technology companies in the United States and Asia." This area of Nevada has seen a rapid rise in exploration success. Access to the Sarcobatus Flat property is ideal as the project lies directly adjacent to a major US highway. Easy access to this flat and arid property means exploration costs are expected to be low and environmental impact will be minimal. The lithium content of soils and vegetation in the Sarcobatus Flat property, as reported by the Company (see Rainmaker release August 4, 2016) compare favourably with samples from Clayton Valley. Rainmaker Resources is a TSX-V listed company focused on creating shareholder value through the exploration and advancement of mineral projects connected to emerging technologies. The company controls an option to acquire the Sarcobatus Flat lithium project in Nevada (see News Release June 9, 2016) and has completed a 43-101 report on the project (November 3, 2016). In addition, Rainmaker currently owns a 12.5% joint venture interest in Dufferin Lake - a uranium asset. Dufferin Lake is operated by NexGen Energy, a public company with a large asset portfolio and a market capitalization exceeding $800 million CDN. For more information about Rainmaker Resources, please visit our website at www.rainmaker-resources.com. For additional information about Rainmaker, please see the company's profile at www.sedar.com. Doug Beahm, P.E., P.G., Principal of BRS Inc, is the Qualified Person, under National Instrument 43-101, who is responsible for the technical content of this release as it relates to the Technical report, and consents to its release. Chris Healey, P.Geo., President and CEO of Rainmaker, is the Qualified Person, under National Instrument 43-101, who is responsible for all other technical content of this release, and consents to its release. The Rainmaker Board of Directors, on whose behalf this release has been prepared, accepts responsibility for its contents. Neither the TSX Venture Exchange nor its Regulation Services Provider (as that term is defined in the policies of the TSX Venture Exchange) accepts responsibility for the adequacy or accuracy of this release. This news release contains forward-looking statements, which relate to future events or future performance and reflect management's current expectations and assumptions. Such forward-looking statements reflect management's current beliefs and are based on assumptions made by and information currently available to the Company. Investors are cautioned that these forward looking statements are neither promises nor guarantees, and are subject to risks and uncertainties that may cause future results to differ materially from those expected. These forward-looking statements are made as of the date hereof and, except as required under applicable securities legislation, the Company does not assume any obligation to update or revise them to reflect new events or circumstances. All of the forward-looking statements made in this press release are qualified by these cautionary statements and by those made in our filings with SEDAR in Canada (available at www.sedar.com).